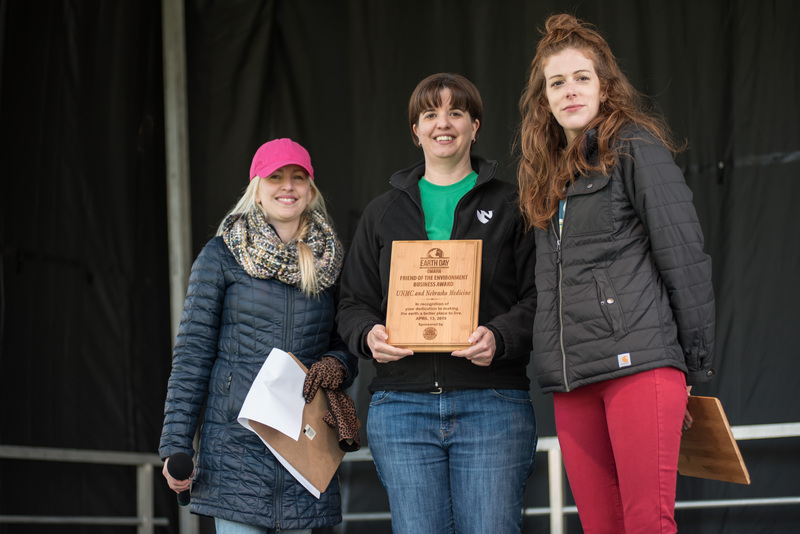 Last Saturday at Earth Day Omaha, UNMC and Nebraska Medicine received the “Friend of the Environment, Business” award by Earth Day Omaha. We are exceedingly proud to accept this award, and thankful for the recognition of sustainability’s connection to health. While their work is energy intensive, they have made great strides reducing emissions and improving health by finding ways to dramatically reduce energy use. The reductions in energy from 2010-2017 resulted in more than 251,000,000 kwh not being consumed and not producing 237,338 MTCO2e. This reduction in pollution impacts all of us, but especially those with lung ailments, and can be tied to more than $20M in direct medical costs and associated societal costs and they just installed the largest rooftop solar array in Nebraska. and is being replicated by others in Omaha due to its success. They are continuously working to reduce waste while increasing the amount that is recycled – diverting more than 12 million pounds away from the landfill in the last 9 years. They have worked to reduce water use and have made reductions of more than 37 million gallons a year while maintaining quality green spaces, planting native plants, installing rain gardens, and being a Tree Campus USA with the Arbor Day Foundation for the 6th consecutive year. An impressive feat given that they have added more than 1,000,000 sq ft of built space in the same time. They are recognized leaders in this region; not only helping to educate its thousands of students, staff, and visitors but is also driving change in other local businesses. Their impressive ‘2030 goals’ help to drive their success and by providing resources and opportunities to employees/students, it maximizes impact and helps our community in countless seen and unseen ways. They are the only medical center/hospital in the region with these goals and one of only 8 hospitals in the entire country with a Net Zero Emissions goal. Thank you to the Earth Day Omaha Board for bestowing us with this honor, and to all of the students and colleagues who have changed a habit and helped us to achieve these goals. Photo credit Rich Watson; from left to right Earth Day Omaha Board Member Sasha Forsen, UNMC/Nebraska Medicine Sustainability Manager Melanie Stewart, Earth Day Omaha Board Member Angie Remington.